I'm trying to contribute a few POIs near where I stay, everything is find on the first part but will would need more guidance on the Track part. Thanks. Very detailed and easy to follow guides for newbies like me. Only thing it hasn't worked for me yet! Please help! I'm using GMXT on my n93i. I have my locations and tracks saved in my handphone. Even the tracks show on my handphone's map as a I have it saved. Only problem is, when I load Mapsource and try to "receive" the POIs and tracks from the "device" it says "The selected device has no maps, waypoints, routes, or tracks on it" Where did everything I saved go? Frustrated as I am keen on contributing new tracks and POIs to MFM. I update more later, I can't say when for now a bit busy helping Bro OngCC doing SG map. 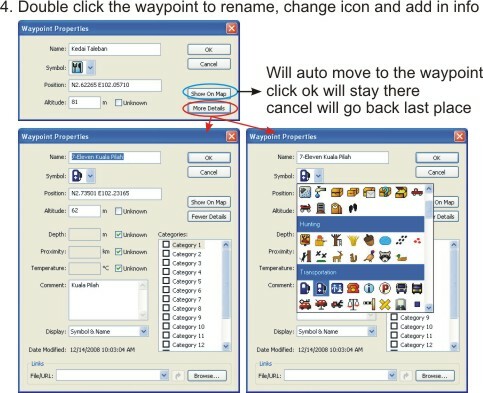 May I ask how do u save waypoints in handphone ? 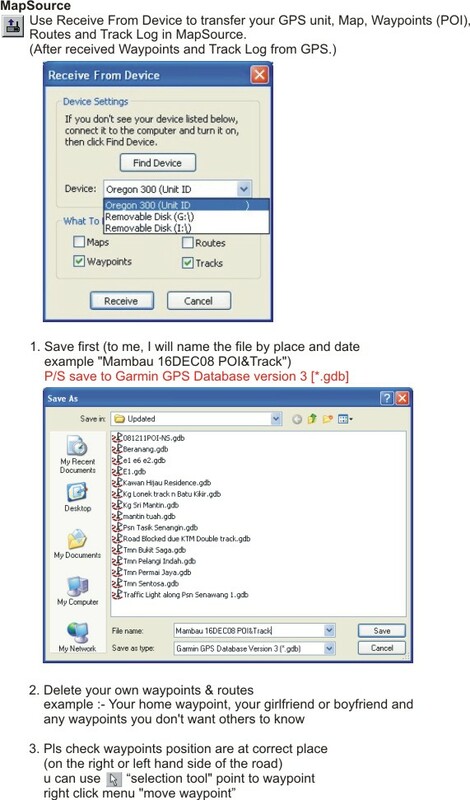 normal GMXT the waypoints will save at SD card Garmin folder example :"H:\Garmin\GPX\Current.gpx"
BTW GMXT track log are not very good. If do tracking there few software u can try Nokia Sport Tracker, RaceChrono version 1.10 and AFTrack v1.21 and others u try search in google "GPS Tracking for Symbian. Thanks bro (Fancheng)! I thought that GMXT would save the tracks in the GPX folder as well, but when I loaded up the SD Card and looked, it just wasn't there. Gave up on that so I took up your suggestion on the other trackers anyway. Managed to find and read some other threads on the reviews and decided to try RaceChrono. It seems to track perfectly. I re-saved it as a *.GPX again (as recommended from someone in another thread) and loaded it up into Mapsource and saved it as a GDB file. Shall make my first attempt at contributing something later in the appropriate region page! Hope I've done this right! Hi there, I'm currently using Nuvi 205W. Is there a way that I can contribute new tracks using this unit? I could not find the setting for this unit to collect tracklogs at 1 second intervals. Please advise. Thanks! tien8tien wrote: Hi there, I'm currently using Nuvi 205W. Is there a way that I can contribute new tracks using this unit? I could not find the setting for this unit to collect tracklogs at 1 second intervals. Please advise. Thanks! Note, Nuvi 205W cannot get 1 second intervals track, and cannot easily turn off locking to roads. However, Nuvi 205W can do "most often" tracks (triplog), that records trackpoints at varying 3s to 20s intervals. You can sort of turn off locking to roads, by totally switching off the map. Very necessary to do that else the triplog will snap to the nearest road in the map. The resultant "most often, no map" tracks from Nuvi 205W, may be useful to our mappers if there is no existing roads at all in that area. However, our mappers really really prefer 1 second track logs because it is much more accurate and much much easier to interpret, particular at junctions. When submitting such "most often, no map", it is even more important for you to review the tracks in Mapsource and add clarification waypoints to areas where the lack of 1 second trackpoints makes the tracks unclear (hard to interpret). Hi There, I'm very new to GPS and having got a set myself (Nuvi 205W), I would like to contribute. I have read most of the FAQs and try to follow instructions on how to to contribute. 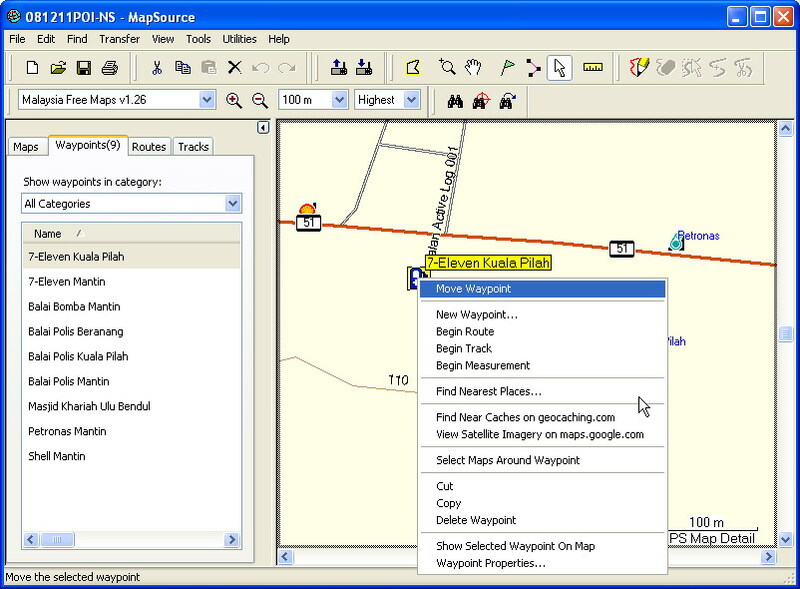 Got my Mapsource up and running after dabbling with it for about 2 weeks trying to install it. Ok, it's up and running and I am ready to contribute. Got a few waypoints and proceeded to click on "receive from device" icon. Mapsource recognise my 205w and I clicked on "Waypoints" and then "Receive". Error message that came out "There was a problem communicating with the Garmin device". I can send waypoints to my 205W but not receiving from the 205W. Now, I am truly frustrated with this and did a lot of seaches to solve this problem. No luck. Anyone can lend a hand ? Not sure if this is the right place to ask. But, what the heck !